George Clooney's publicist told the Washington Free Beacon that he has set up interviews between children who survived the Parkland shooting and media outlets. 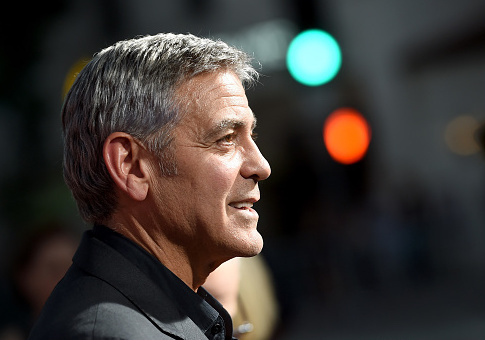 Stan Rosenfield, who represents Clooney, said he was "approached by a friend, not Mr. Clooney, to help set up television interviews last Sunday." Rosenfield said he set up five interviews on Sunday with Fox News, CNN, ABC, NBC, and CBS. When asked whether Clooney is paying for the publicity or endorses facilitating the interviews with the children survivors, he said Clooney's statement on donating to the "March for Our Lives" campaign "answers all of your other questions." "Mr. Clooney has been a client of our office for over 16 years, however, I am doing this pro bono as I hope you would if victims of a massacre ask for your help," Rosenfield said. "Amal and I are so inspired by the courage and eloquence of these young men and women from Stoneman Douglas High School," Clooney said in a statement. "Our family will be there on March 24 to stand side by side with this incredible generation of young people from all over the country, and in the name of our children Ella and Alexander, we're donating 500,000 dollars to help pay for this groundbreaking event. Our children's lives depend on it." Parkland students appeared on all the major political Sunday morning shows, including CBS's Face the Nation and NBC's Meet the Press, calling for more restrictions on guns. The "attention is on us now," they said. Rosenfield is president of Stan Rosenfield & Associates, an entertainment public relations firm in Los Angeles. Rosenfield represents other big Hollywood names besides Clooney, including Robert De Niro, Danny DeVito, Helen Mirren, and Charlie Sheen. Rosenfield has not been very active in politics, donating to only two campaigns, including $2,700 to Hillary Clinton in 2016. His support has gone to a politician who once fought for an endorsement from the NRA: George Clooney's father. Rosenfield donated $1,000 to Nick Clooney's campaign when he ran for Congress in Kentucky in 2004. The Cincinnati Enquirer reported at the time on Nick Clooney's support for the Second Amendment. "Nick Clooney supports vehemently the Second Amendment and would vote against any new federal gun restrictions," Bob Doyle, Clooney's campaign consultant, told the paper. Doyle also said the Clooney campaign was "not attacking the NRA."